Preheat oven to 350°F. Spray an 8 X 8-inch baking pan with nonstick cooking spray and set aside. Place the black beans – one 15 ½-ounce can, drained and rinsed – in the bowl of a food processor; process until smooth and creamy. Add 3 large eggs, 3 Tbsp. canola oil, 3/4 cup granulated sugar, 1/2 cup cocoa powder, 1 tsp. vanilla extract, 1/2 tsp. baking powder, 1/2 cup flour, a pinch of salt and process until smooth. (The Moms also suggest adding 1/2 teaspoon peppermint extract, but that’s optional.) Add ¼ cup of chocolate chips and pulse a few times until the chips are broken up. Pour the batter into the prepared baking dish and sprinkle the top with ¼ cup chocolate chips. Bake 30 to 35 minutes, or until the edges start to pull away from the sides and a toothpick inserted in the center comes out clean. Cool in the pan before slicing. Makes 16 amazingly fudgy and chocolate-y brownies. As far as brownies go, these are the healthiest you’ll find. Black beans are a great source of fiber, folate and a good source of iron. What better way to give your brownies a nutritional boost. If you follow Janice and Liz’s recipe, each brownie contains 120 calories, 5g fat (1.5g saturated, 0.3g omega-3), 95mg sodium, 18g carbohydrate, 2g fiber, 3g protein. What did you think of the black bean brownies? Did you modify the recipe to include other ingredients? Let us know if you enjoyed them as much as we did! 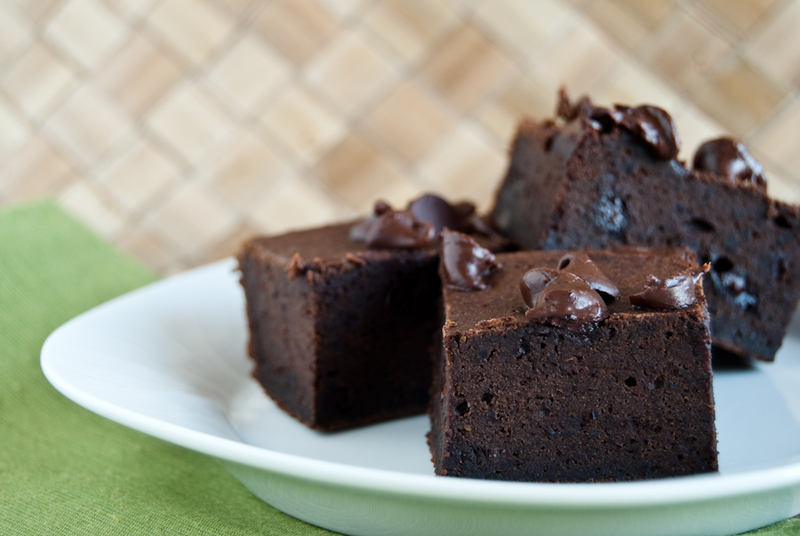 Thanks for featuring our Black Bean Brownie recipe. So glad you enjoyed it. Your photo is beautiful! I just heard about using black beans in brownie recipes yesterday. But, the lady who was telling me about it just used a boxed cake mix. Instead of mixing any of the listed ingredients, she only mixes in black beans! Great idea! Gotta love the Meal Makeover Moms! So there’s no flour in these brownies? I want to try this, but let me get this straight. Is there no flour in this recipe? Let me tell you, I did not like black bean brownies. I made a batch a couple months ago and I did not like their taste, consistency, nothing. I would take an unhealthy fudgy brownie any day over black bean brownies. I used a dif recipe, but I don’t think it mattered. I think you really have a different kind of taste bud for that kind of a dessert. Justin and Maria – So glad that you asked! I added 1/2 c. of flour to the recipe. You can also add 1/2 c. pureed/canned pumpkin. I did the latter because I had it lying around the house. thank you. thank you for sharing this recipe. i made these last night and i’m in love! I am soooo intrigued by this, I will try them out this weekend has anyone ever tried them with rice flour? I am working really hard at helping a friend get some new recipes that work around her long list of allergies. Oh and the picture makes you want to just reach in and grab one. Kristina – I added 1/2 c. of AP flour, so you might want to try rice flour as a substitution. Give the recipe a shot! Hope that your friend can enjoy them. Black Bean Brownies « Sweet Tater | Food | Fitness | Etc. I made these tonight! I made a huge pot of black beans, and needed something to do with them. I am sooo excited to have found this recipe. They were great! So silky, fudgy, and chocolatey! You would never know there were black beans in them! My boyfriend also loved them. He even said he wants to take him to his potluck at work! I made them as is, without mint. I may have added extra chocolate chips too 🙂 Wonderful recipe!!! I had high expectations for these brownies, but I am so disappointed. I followed your directions, only altering them to add pecans and ended up with cake-like bland hunks of ugh. The batter was delicious, the end result was a total waste. There is nothing fudgey about these brownies, they are cakey. I wish I could get the pecans back to put in something better. I’m the queen of altering recipes to be healthy, but these were a sore disappointment. I used applesauce or baby food prunes for the oil and splenda (i used 1 cup) for the sugar. They tasted good, but don’t expect them to taste like regular brownies. I will make them again! I was skeptical about this recipe but tried it the other week. Not only did they exceed my expectation but my husband ate three when I first made them! I just took the second batch out of the oven for work tomorrow. My only thought is how to make them a little chewier…although good they are more like cake than brownies.